Strong, superior and supportive, Milford, New Hampshire emulates the characteristics of everything it is known for as being a city in the “Granite State”. With traits such as these, it is easy to see why starting a business or raising a family is so comfortable to do here. The small town feeling of Milford motivates people to contribute to their community and to take part in its success. Much like the way Milford is nestled on the Souhegan River, this little New England town reflects all the charm of the region. Farmers markets, close-knit communities and the notable New England fall foliage all exemplify the tranquility of the city itself. Milford is located near well-worn routes like Highways 101 and 101A that easily transition people throughout the state of New Hampshire to cities like Manchester and Nashua, but also make the commute into Massachusetts a seamless and beautiful one. Wherever you choose to go, you will be sure to experience scenic routes all around! Known for “the Milford Oval”, this little city boasts a big draw at its heart where many events take place during the warmer weather months and many beloved dining spots are located. Here, you can find the favorites in places such as the Pasta Loft, Amigos Mexican Cantina, Café on the Oval and the Red Arrow Diner – just to name a few! Known for sourcing local and its friendly people, Milford is a great place to spend your time throughout the year. Milford is proud of its culture at home. From evening concerts, hiking Pat’s Peak and Crotched Mountain to participating in the widely known October Pumpkin Festival, the city is sure to bring you and your family year-round appeal. The farmer’s markets cultivate a large draw, as well as enjoying summer days on the river. Whatever you choose to do, Milford is sure to showcase its beauty and attractions in many more ways than one. Allow Aspen Square Management to assist you in finding the perfect apartment in Milford, NH for rent. Our quality homes and communities provide only the most qualified staff and team to help you feel right at home from the moment you step through the door. Whether you are seeking student housing or a comfortable place to raise your family, we are excited to welcome you! Brookstone Manor apartments homes provide superb amenities and feature a 24 hour maintenance staff for your comfort. 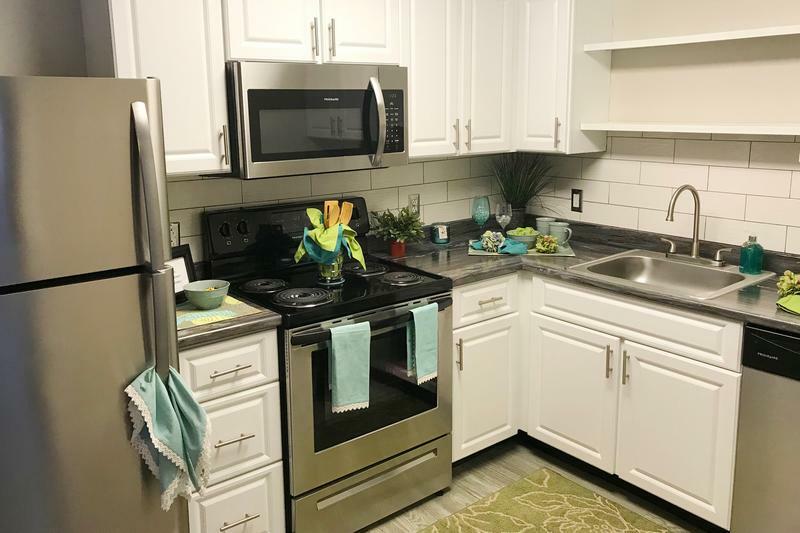 Our apartments for rent in Milford, NH offer one and two bedroom spaces with renovated, fully applianced kitchens with white cabinetry, granite-style countertops and stainless steel appliances. Enjoy the comfort of your new home with air-conditioning, access to a private patio or balcony, spacious bathrooms, in-home washers and dryers in select floor plans and so much more! We are committed to making your living experience unique and personal, so we encourage you to take advantage of all that our apartments in Milford, NH have to offer both indoors and out. Our lushly landscaped grounds feature playgrounds for children, picnic areas to enjoy an outdoor lunch underneath the fall foliage, off-street parking and a pet friendly atmosphere with a fabulous “bark park”! That’s right! We hope you bring your furry family members along to our apartments for rent in Milford, NH! It wouldn’t be home without them. Located within walking distance, Keys Park offers plenty of recreational space for you, your family and your pets to enjoy. Walking paths, swimming pools, playground/picnic areas, basketball and tennis courts as well as large fields - Milford is proud to offer a little something for everyone! Whether its just you or your entire family, we would love to welcome you home here at Brookstone Manor apartments in Milford, NH! Give us a call today to schedule a tour and discover what it is like to live with the Aspen difference at our Milford, NH apartments for rent!